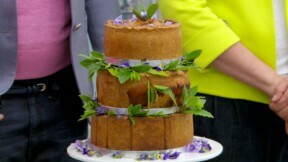 Kate's rhubarb, prune, and apple pork pies appeared in the Pies and Tarts challenge of The Great British Baking Show. Grease the cake tins (1 x 10cm/4in, 1 x 15cm/6in and 1 x 20cm/8in springform tins) and dust them with flour. For the rhubarb, apple and prune flavorings, put the rhubarb and 50g (1¾ oz) sugar in a pan set over a medium heat. Bring to the boil, then reduce the heat and simmer for at least 10 minutes to allow any water in the rhubarb to evaporate. When the rhubarb is quite dry, set it aside to cool. Place the remaining caster sugar and chopped apples in a saucepan set over a medium heat. Bring to the boil, then reduce the heat and simmer until the moisture has evaporated and the mixture is quite dry. For the filling, mix all the ingredients together in a large bowl, then divide the mixture between three bowls - with just under half the mixture in one bowl, about a third in another and the remainder in the final bowl. Add the rhubarb, apple and prune flavorings, with the rhubarb in the large bowl, the apple in the middle and the prune in the smallest. Squish well with your fingers to mix. For the hot water crust pastry, sieve the flours and salt into a large heatproof bowl. Place 440ml (16 fl oz) water and the lard into a pan and bring to the boil. Add the hot liquor gradually to the flour mixture and use a knife to bring the dough together. While the dough is still hot (but cool enough to handle), use your hands to briefly knead the dough until smooth. Turn out onto a lightly floured work surface. Pinch out a third of the dough to make the pie lids. Divide this into three pieces and roll them out (make sure that each lid is just a little larger than the circumference of the tin you are making it for). Use the off-cuts from the lids to make leaves to decorate the pies. With the remaining dough, roll out three large circles each one big enough to line one of the tins. Using a rolling pin to help you, line all three tins with the pastry. Push the pastry up the sides of the tins to the top ensuring there are no holes or cracks anywhere. Fill the pies with the respective fillings. Make sure the fillings reach about an inch from the top of the tins. Brush the top of the pastry case with beaten egg then place the lids on top, crimping the edges well to seal. Using a small sharp knife, make crosses in the middle of the lids and peel up the corners to reveal a hole. Stick a fresh bay leaf in each hole to keep it open whilst cooking and also to add flavor. Bake the pies for 30 minutes, then remove the smallest pie. Turn the oven down to 160C/325F/Gas 3 and bake the medium-sized pie for a further hour and the largest for a further 1½ hours. When the pies are cooked, carefully unfurl the sides of the springform tins and remove (keep the base in place) – if the pastry is too soft to hold its shape, secure the sides of the tin and return to the oven for a few minutes before testing again. Brush the sides with beaten egg and stick the reserved pastry leaves all around the outside then egg wash again. Return to the oven for a final 30 minutes, or until golden-brown. Meanwhile, make the purées. Chop the prunes and mix them with a splash of water. Blend to a purée using a handheld blender. Taste and add approximately 10g (⅓ oz) sugar, or sweeten as desired. Transfer to a piping bag fitted with a plain nozzle and set aside. Next make the apple purée. Put the apple in a pan with a few tablespoons of water and 10g (⅓ oz) sugar and cook until the apple is soft. Blend to a purée using a handheld blender and set aside to cool slightly. Spoon the purée into small serving dishes and set aside. Repeat the process using the rhubarb, but adding a little more sugar. For the decoration, when the pies are cooked remove the bases of the tins and transfer to a cooling rack. Remove the bay leaves and place each pie on its corresponding cake base. Insert four dowels into the 20cm (8 in) pie and five into the 15cm (6 in) pie. Place the pies on top of each other on a circular wooden chopping board with the 10cm (4 in) pie at the top. Decorate the tiers with edible flowers, bay leaves and fresh parsley. Serve the pies with the purées.